Home › Downloadable Music › Français ! Français ! Étienne has teamed up with Roland Bibeau to produce this CEFR-friendly French introduction to important French vocabulary of all kinds for students starting out in French or for those needing a good review. This album features 10 dynamic vocabulary-based songs and 10 instrumental versions that are perfect for class time karaoke. Complete album download of all 20 songs. Good for beginners. 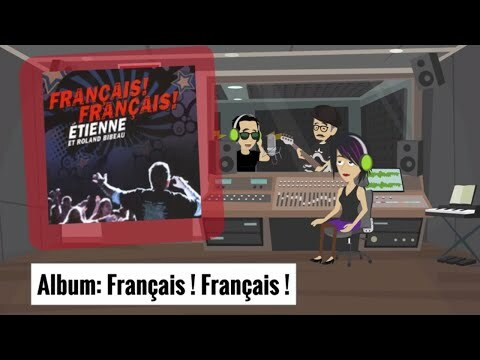 A rock anthem song featuring basic, common French vocabulary and expressions. A rock song covering common classroom vocabulary and expressions. Cherchez partout (La maison) ! A funky song that plays like a game of hide-and-seek covering common house vocabulary and expressions. A folky song for French color vocabulary. A blues song covering key family vocabulary and interesting brain-teasers. A fun song that teaches days, months and all common French calendar vocabulary. A sly song that plays like a fashion song covering common French clothing and expressions. A song that plays like a game of Simon Says! interactively teaching common French body parts. A catchy song covering French numbers from one to one million. A rap song that takes you on a ride teaching common French transportation vocabulary and expressions.